"How rural life is dying in the new China"
The village beside Poyang Lake provides vivid proof of the flight from the land in the vast rurql interior. 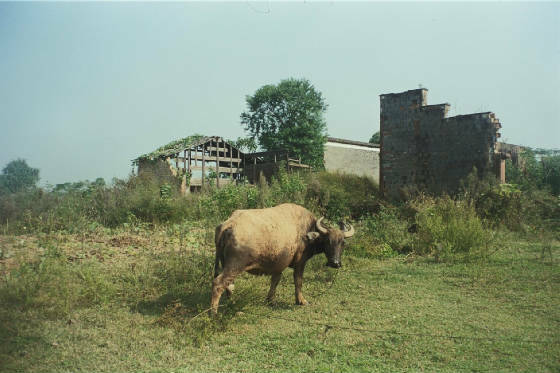 No attempt has been made to reclaim the abandoned houses and gardens where a single young buffalo grazes the turf quietly. "Ninety per cent of the children here have been abandoned, 60% are disabled and 70% are girls. Sometimes they leave them right outside the gate: the mothers are migrants from the countryside. They see what a fine place this is and want to make sure their children are taken in." "The AIDS scandal China could not hush up"
"China's challenge: fighting rural poverty"
Questions about annual per capita income mean nothing on a remote hillside in the south of Yunnan. The village head squats on the ground and searches for an answer. "If a family has a pig and sells it, then they can earn some cash," he says. Zhang Meifeng looks out from under the blankets of her bed in an icy rural hospital in central China, and lists the benefits of breast-feeding. She has been inspired by the maternal and child health (MCH) project, sponsored by Unicef and run by the ministry of health. "800 million suffer as Beijing miracle turns into mirage"
Four young Chinese peasant girls - Brilliant Frost, Winter Plum, Auspicious Grape and Cultured Grace - died last month on Train 105, on a cold grey morning soon after Chinese New Year. The express from Beijing to Shenzhen - the boom town on the Hong Kong border where they sought work - was already packed. At Shangqiu in Henan province, several hundred more migrants struggled to board with their cheap leather bags and cotton sacks of clothing.